Here’s a recap of what we were up to in May and a look ahead to upcoming opportunities for the Mission43 community. Spring Skiing at Bogus Basin It was a first of its kind for Mission43. 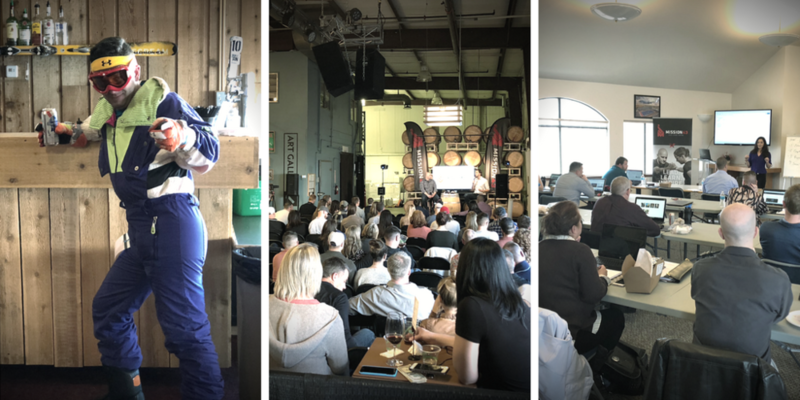 On March 10th we hosted the M43 Family Day at Bogus Basin and had nearly 200 people turnout for the event. The weather was perfect for spring skiing and we enjoyed some local craft brews and a fajita bar in the Pioneer Lodge. We are already looking forward do doing this again next year and hope you can make this great family-focused event! 43INC with Jake Wood On March 15th we sat down with Jake Wood, one of the top veteran non-profit leaders in the country. In 2010, he co-founded Team Rubicon after taking the initiative to go to Haiti and lead a team supporting those who had not been reached by any disaster response organizations. Since then, the TRibe has deployed on hundreds of operations and has grown to over 75,000 volunteer members. Jake is a proven leader who found incredible purpose for himself and others after leaving the military. Like all previous guests, we were excited to hear about his experiences and be inspired by what he has accomplished. Be sure to check out our three key takeaways you can apply in your life from our 43INC evening with Jake. READ MORE: SITREP BLOG "THREE TAKE-AWAYS FROM 43INC WITH JAKE WOOD"
Federal-Focused Employment Workshop Seeking and obtaining federal employment is typically a different process than what you would experience in the civilian market. Many veterans and military spouses find great federal opportunities and are definitely qualified, however they miss out on the opportunity because they don’t know how to be seen in the USA Jobs system. For this reason, Hire Heroes USA has a specialized team that helps those seeking federal employment. On March 22nd, that team hosted the Federal Employment Workshop on Gowen Field, home of the Idaho National Guard. Over 20 participants including military spouses, active duty, National Guard, and former military members attended. It was clear that their federal-focused resumes and USA Jobs profiles benefited from the one-on-one consultation. True to the Hire Heroes USA mission, they are now empowered to succeed in this system. Keep an eye out for future workshops on our events page and help spread the word about these opportunities. The TACP Fitness Challenge The TACP (pronounced “Tack-P”), or Tactical Air Control Party, is a small team of Air Force personnel that embed with the Army and Marine Corps to call in air strikes on enemy targets. To get to that point, a TACP has survived close to two years of continuous evaluation that is both physically and mentally challenging. We are excited to be part of this great community event with Idaho TACPs called the 24-Hour TACP Challenge, benefiting the TACP Association that supports the families of the fallen and those in need. Don’t worry, it’s not a requirement to participate for 24 hours! You can run, walk, or ruck to log as many laps as possible over the 4-mile course in the foothills of Eagle, Idaho. If you just want to be part of the event, there is plenty to do with music, military equipment, and food while enjoying the atmosphere. We’ll finish with a Mission43 BBQ kicking off at 12:00pm on Sunday! Get your Team Stone shirt (featured above) while supplies last. All proceeds go towards the TACP Association so this is a great way to give even if you can’t make the event. Hire Heroes USA North Idaho Employment Workshop Hire Heroes USA is heading to Lewiston to host a one-day employment workshop on the campus of Lewis-Clark State College for military spouses, veterans, and currently serving military. Get off to a great start in person with your Transition Specialist that you will be working one-on-one with to be successful in your career transition. Head over to our events page to get registered! You have asked (a lot) and we finally have an answer! For those of you that want to purchase M43 gear, you can now head over to our M43 online store and get some of the most popular gear. We are excited that the proceeds from every purchase will go directly back into veteran non-profit work in Idaho so your dollars spent will continue to have a local impact. Big thanks to Boise-based Name Brand Promotions in helping us create some great swag and getting this out to our friends and family! Feel free to give us feedback on what you’d like to see in the future. Stay up to date on all our upcoming opportunities on the Mission43 Events page. Here’s a sample of what we have coming up. Friday, April 20th: 43INC Happy Hour at Powderhaus Brewing. Meet the Team Stone 24-Hour Challenge crew, pick up your event shirt, and take part in the Mission43 foundational networking event. Saturday, April 21st- Sunday April 22nd: Team Stone 24-Hour TACP Challenge. Challenge yourself to log as many laps as possible while you walk, run, or ruck over a 4-mile course in the Eagle foothills. Monday, April 23rd: Charity Miles Monday. Run or walk, this is for all ability levels (and families too)! Join us for this month's Charity Miles Monday, where the M43 community comes together to help raise money for charity by logging miles with the Charity Miles app. Friday, May 4th - Monday, May 7th: Team Rubicon Type II Wildland Firefighter Training. Get qualified to help protect our public lands from fire. Summer fighting season approaches! Saturday, May 5th: TEDx Boise featuring Mission43 speaker, Noah Siple. Noah is an incredible leader and advocate in the Idaho veteran community and we couldn’t be more excited that he is talking about Mission43 at this huge event.